At Developh, we’ve always been fascinated with the fact that technology opens up the potential for students from any part of the world to build groundbreaking things armed with the smallest of laptops and the most brilliant of ideas from their bedroom. We’re at a unique point in time where innovation can come out of anyone, anywhere — with so many things to solve and so many avenues to explore. However, with the potential of great innovation are dozens of barriers: from resource, motivation, community, to foundations. In a world so rapidly-filled with innovation, where do we start building the solutions that we need? 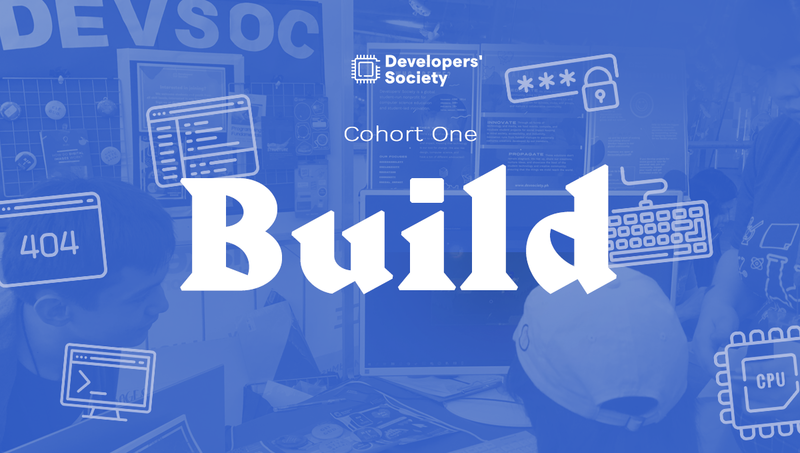 Eligible to students in high school and college with willingness and commitment to meet an amazing thing and build cool things, we put together teams with a mix of members from Developh and recruit outsiders to help guide the development process. Fellows will be introduced to a tight-knit group of creators with different skills but the same heart for the problems they set out to solve. At the end of the fellowship, your project should be out and launched to the world: you’ll be ready to see its fully-fledged body out in the world, deliver a pitch for it, and maybe wear some swag for your venture! The fellowship is the kind where you definitely get more out of it the more you put in it — especially since it’s open to people of all skill levels. We like to also say that it’s a learning experience as much as a development one, and what better way to pick up some new skills than to put together a project surrounding it? Thus far, the two projects for the cycle surround a mobile application for mental health and wellness, and a multimedia + research campaign for voter education and civic engagement towards the Philippine 2019 midterms. As long as you’re interested and willing to learn, then the fellowship is definitely for you! Our aim is to equip students with passion with the skills they need to make things happen. We’re going to be walking you through the ins-and-outs of things based on the skill you’re interested in learning. Even if you’re never touched a code editor or really only have put graphics together in your head, we’ll bring everything together. How long is the development period? How much time should I commit? The project development period is set to take place no longer than three months: from final touches on ideation to shipping the project out there. Because of the timeframe and especially if you’re going to be needing to get a hang of the basics (whether it’s the development language or working on a team project setting itself), please expect to dedicate at least 4 hours a week. Some of your time will be reserved for meetings, others for special calls, others for training, and others for self-directed assignments. And as said, the more you give, the more you get out of it. But: a good rule of thumb is that the more you need to learn, the more time you should expect to give in. What if none of the projects currently interest me? 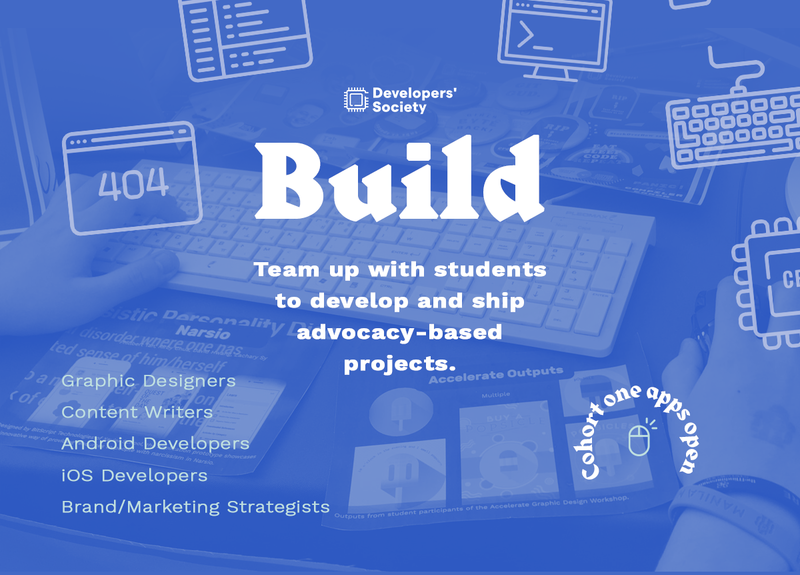 If none of the advocacies or formats currently work for you, you can stay tuned for the next cohort of Build projects. Feel free to give us a suggestion or a nod to what you’d like to work on through our social accounts. In the meantime, we hope you stay along to follow the progress and journey of our current projects and teams so you’ll know what to expect! I have another question that isn’t listed here. Send us an email at wedeveloph@gmail.com and we’ll get back to you as soon as we can! Developh recently rebranded from Developers’ Society. Learn more about the organization at developh.org. Developh believes that in a world fueled by technology, every student deserves to be a part of developing their future. Hear our stories, projects, updates, and developments.